It’s no secret that Broward Stage Door Theatre will vacate its current premises on West Sample Road in Margate and move to newer, more modern and technologically advanced digs at the Lauderhill Performing Arts Center this fall. 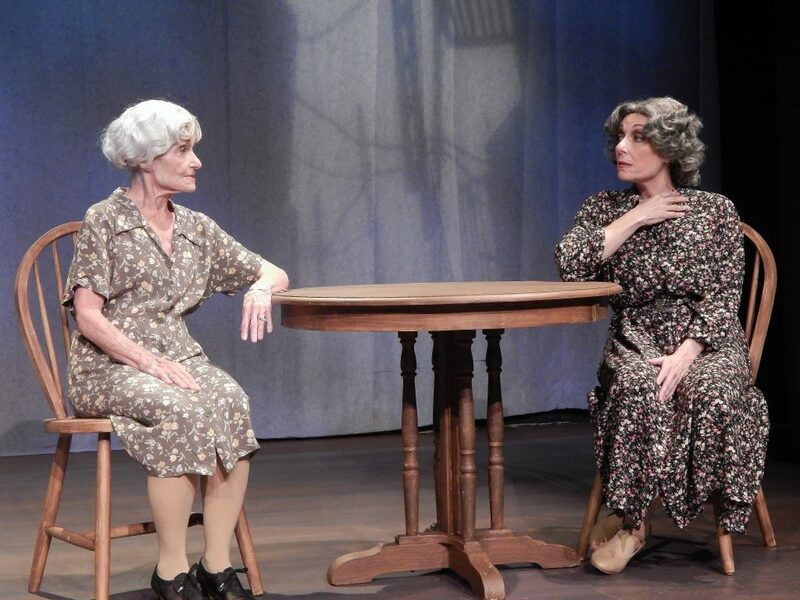 So, it’s a bit touching that the next-to-the-last production at Broward Stage – James Sherman’s From Door to Door – is very much a throwback to the days when the Broward theatrical site offered a variety of shows highlighting Jewish families, their traditions, heritage and, often, their adaptations to a new country. While the shows were of interest to all, they often contained material with special meaning to a Jewish audience. Two things combine to make From Door to Door, which is at Stage Door through July 1, lively enough to maintain the audience’s attention and lift it above the mundane. It negotiates lots of territory in a short time. The one-act play with no intermission concludes in just under 90 minutes. Then, there’s the cast. Not only has Sherman crafted the characters well, but the actors grasp their roles aptly and with a quality that’s genuine. From Door to Door tells the tale of a Jewish family as they progress through a three-generation span from 1936 to 1999. Early on, the audience seems to focus in on the special traits about this family. Each person – and there are only three — rises above clichés to capture realism in their roles. They present themselves as authentic folk, not caricatures. The play’s title is drawn from the expression, “L’dor va dor,” Hebrew for “from generation to generation.” It refers to continuity – to the responsibility of passing on spiritual knowledge and cultural traditions for the purpose of sustaining customs, heritage, and collective memory. This isn’t as easy as it sounds. Each generation does the best it can to pass along tradition while adapting to changing times. As each new era comes along and becomes better acquainted with American values and traditions, they begin to put pieces of their culture on the back burner. Director Michael Leeds has cast Marah Lieberman as Deborah, the youngest; Elli Murray as Mary, of the middle generation and Fern Katz as Bessie, the family matriarch. Katz and Murray are mother and daughter in real life, which Leeds believes brings an added measure of poignancy to the production. The director has also chosen to present the show with minimal distractions: no props, and only a table and three chairs on the stage. No set. The focus is directly on the characters – what pieces of heritage they keep and what things they change with the passage of time. As the play opens in 1999, Mary Goodman, a woman who reached her prime during “the greatest generation,” is mourning the death of her husband. As Shiva ends, her daughter, Deborah, encourages her to end her mourning and adopt a new sense of independence with the 21st century just a year away. In a series of flashbacks, we see how Mary interacted with her own mother, Bessie, during the early years of her life and as she got older. The play touches on many critical mother-daughter moments from Mary’s past. As we see Mary’s life progress from childhood through matrimony to motherhood, we begin to understand how each successive generation of women lives up to the expectations of the past and must make bold choices about the future. Sherman clearly links the plight of Jewish women with the status of women in general. As a child, Mary wanted to be an artist, but her mother nixed it, saying art is not for girls (or for Jewish girls, she might well have added). During her youth, Mary had to deal with other prohibitions and restrictions placed upon her by Jewish beliefs. She finds them a strain, but consents to most of them anyway. As we expect, when Mary’s own daughter, Deborah, grows to adulthood, she more easily casts aside bits of her Jewish heritage as she pushes ahead with her career, marriage and child-rearing. As the show concludes, we see how love, loss and understanding have given them the strength to carry on. From Door to Door is playing through July 1 at the Broward Stage Door Theatre, 8036 West Sample Road, Margate. Tickets are $48 and are available by calling 954-344-7765 or visiting www.stagedoorfl.org.